Originally a small fishing village, Moraira has grown into an ideal holiday retreat of perfect proportions, retaining much of its original character and atmosphere. It has attractive and colourful main streets, a picturesque Marina and wonderful blue flag sandy beaches. The choice of restaurants and bars are just too many to sample in one holiday. There are seven recommended by Michelin (three with stars) and a huge variety of others to suit all budgets. The combination of terraced vineyards, wonderful mountains and blue sea, combine to make this an area of spectacular beauty. 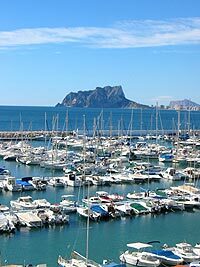 Thankfully, the local authority has jealously guarded the appearance of Moraira, which has prevented the over-developed characteristics of other Spanish resorts. There are no high rise holiday hotels here. In fact, there are no package holiday hotels here at all. Instead, beautiful private villas and 'pueblo style' developments line the slopes of the valley, which gently decline towards the beach and town. This dictates to a degree, the type of holidaymaker found in Moraira. Those attracted to this resort, tend to be family units, using or renting privately owned villas. The character of the coastline, with its stunning cliffs and dramatic headlands, means that the beaches are mainly small coves and bays. The largest beach, Ampolla, is situated right at the centre of the town. With its shallow waters, white sands, children's play area and volleyball court, it is perfect for families. The delightful Portet beach lies in a bay, to the left of the marina, and is just as popular with families. The two bar/restaurants here are famous for excellent lunches and fabulous sundowners. All the beaches along this part of the coast have been awarded an EEC Blue Flag for cleanliness. If the beach isn't your thing, then there are plenty of other things to do. That is, assuming you can pull yourself away from your luxury villa! The local shops and night market offer a really excellent choice of quality clothes, gifts and keepsakes. There is a fairground, especially suitable for young children, a fabulous Go Karting circuit, for all ages, a tennis club and three nightclubs. Also nearby are three golf courses, horse riding, and water sports centres. The larger resorts of Javea, Denia and Calpe are all within a half hour drive. Benidorm is also well within reach. Here you will find all the children's favourites- Terra Mitica Theme park, Aqualandia Water Park and Mundomar Animal Kingdom, with its world famous dolphin show. If countryside and mountain tops are what you seek, then within 40 minutes you can be witnessing the breathtaking views at Guadalest or at the summit of the Sierra Bernia. Also, in just over one hour, you could be in Valencia, Spain's beautiful underestimated 3rd city. 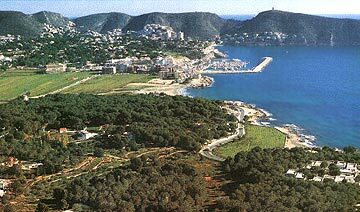 Moraira, like many Spanish towns, hosts many different fiestas throughout the year. The most famous is the 'Moors and Christians' festival, usually held over the 2nd or 3rd weekend in June. The elaborate customs and parades are a real spectacle. You will be astonished that a small town such as this, can stage such a grand and marvelous event. The Patron Saint fiestas in July are colourful and noisy, and culminate in a huge, spectacular firework display usually on 15th and 16th of July. There are many other towns fiestas during the year, too many to mention here. If you would like your holiday to coincide with a fiesta then we will be happy to advise you with actual dates and event times.